On Saturday, September 12th at 1pm, Kelechi Eke, who was bestowed the Movie Achievement Award fron LANFA (Los Angeles Nollywood Film Awards), will be premiering his award-winning films, “The Other Tribes” and “Weeping Ashes,” as the ACME Studios in North Hollywood. 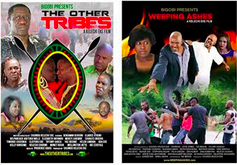 “The Other Tribes” explores the biases tribes have towards each other and “Weeping Ashes is based on true events that primarily took place in Uganda. LANFA’s goal is to promote actors, actresses, directors and producers in Nollywood to Hollywood, and to develop a technique that will enable them to work together in producing quality films. This goal gives greater media exposure, increases awareness, visibility, and opportunities to those who need to promote their projects. This esteemed organization also wants to eventually build a healthcare center in Africa to give the best medical help for those in the film industries and others who can’t afford to do so. Another goal of LANFA is to construct a state-of-the-art studio in Los Angeles for the production of technologically advanced film, TV, and theatre projects. King Bassey is the founder and CEO of LANFA.